Graham: What would be the biggest benefit to the “One Fly” concept? Daniel: The idea of using one fly pattern and not changing it is one of the most difficult concepts to embrace, but also the most liberating. When you learn how to use one fly (or rather, rely on any fly) you can go anywhere and catch fish. Secondly, you never second-guess your fly choice and are able to keep your fly in the water without changing it all the time (what is to say the next cast with your fly wouldn’t have caught a fish). I also like to point out how if an angler changes flies 20 times in a day and each time it takes 3 minutes that’s one entire hour of wasted fishing time. Graham: What attracted you to this concept? Daniel: I was as skeptical as the next person about the idea of using (any) one fly. It took me about 1 1/2 year to fully abandon the idea of changing flies; it was difficult to let go of all those patterns I was told I needed to use. But, what I finally realized is how refreshing and liberating not having to change flies was. 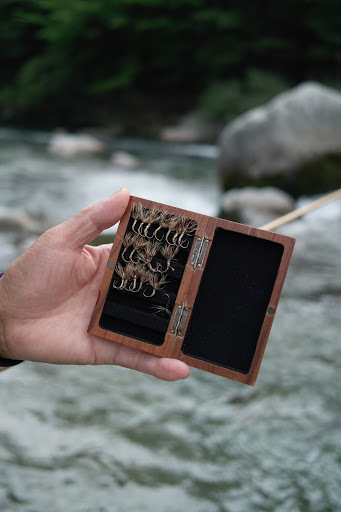 I had such a good feeling the day after I threw out all my “just-in-case” flies and I went fishing. I got on the water and kept moving up, casting to one spot after another and focusing on technique and catching fish on many of the pools I tried. It was totally relaxing. Plus, a few days later I flew back to California and went fishing a different stream without having to worry about what flies, and then I went to Colorado with the same fly box in a different season. I can fly anywhere in the world in search of trout and not have to worry about what is hatching. Graham: Other than Dr. Ishigaki are you aware of any other tenkara practitioners in Japan who prescribe to the “One Fly” concept? Daniel: Most people who focus on tenkara or have been doing it long enough will stick with their one fly. All the so-called tenkara masters I know use only one fly pattern; but I should note that some may be very strict, like Mr. Katsutoshi Amano whose flies are all identical in size and color; Dr. Ishigaki on the other hand says he gets bored of tying the exact same fly, so his flies vary a little in color and size, but he says he doesn’t think much about what fly to tie on.